Essentially established by the Merritt, Wheeler, and Ely families, Oneota Township developed along St. Louis bay at about today’s Forty-Second Avenue West. Edmund Ely arrived here first, then soon asked St. Paul’s Henry Wheeler to come north and set up a sawmill near Forty-Fifth Avenue West. By 1856, when development opened for Europeans on the northern half of Lake Superior, Oneota Township was ready to incorporate. That fall Hepzibah Merritt and five of her seven sons arrived to set up a homestead with her husband Lewis, who was already there with their two oldest boys. 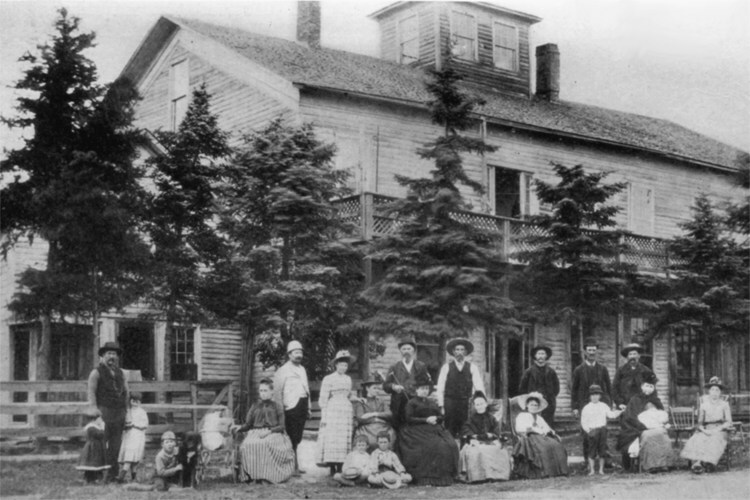 Among the buildings they constructed was the Merritt Hotel (shown here, date unknown, with much of the Merritt family). The Merritts would become famous for gaining and losing a fortune in iron mining. The Wheeler family remains prominent in Duluth business, and we have them to thank for the Wheeler Field softball complex, once known as the Wheeler Race Track and Oneota Park. It took a while for all of Lower Oneota to disappear. It started in the early 1960s, as houses were purchased and demolished to make way for the Interstate 35 extension to downtown. Everything between Michigan Street and Oneota Street—homes, schools, warehouses, manufacturing plants—was destroyed. 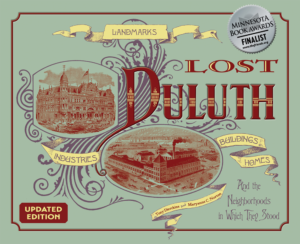 Twenty-five more homes and other properties were lost in the late 1970s, from Fortieth to Forty-Seventh Avenues West between Michigan and First Street, to make way for the Oneota Industrial Park. The city also created Mike Colalillo Drive at this time to connect the new industrial park to Interstate 35. Unhappy residents—one family called Mayor Robert Beaudin and the Housing and Redevelopment Authority “a bunch of land grabbers”—filed a petition to request an environmental impact study, hoping to derail the project. Other residents, pleased to get a fair-market value for their unsellable homes, started a counter petition. The effort to stop the process failed. More homes were lost in 1980 and 1981 when the Richard I. Bong Memorial Bridge was constructed. In 1984 the last of the Lower Oneota Homes were purchased for demolition. These were in what was termed the “Oneota Isolation Pocket,” a two-block area containing twenty-five houses bounded by the Bong Bridge, Superior Street, railroad tracks, and industrial yards. Tom Black, a lifelong Oneota resident, had moved his entire house to the area in 1962 so that it wouldn’t be lost to the initial Interstate 35 construction. He lost his Oneota house in this final wave of demolition.